So that was my starting point. 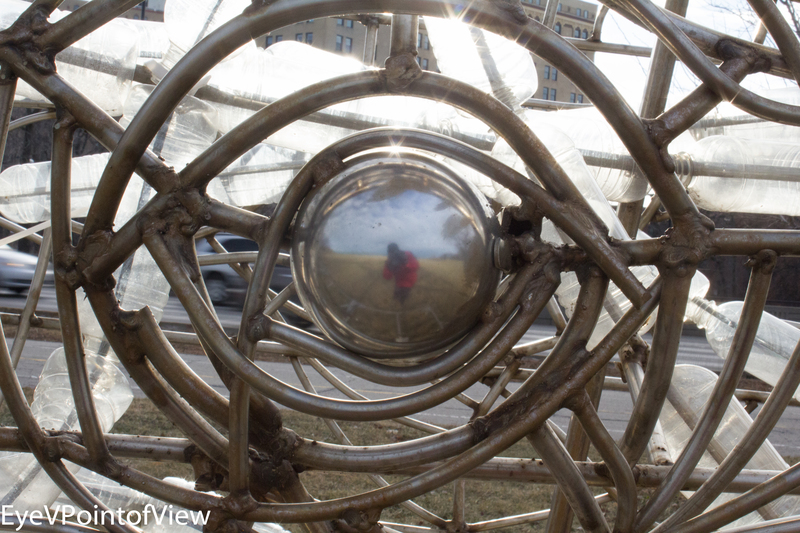 Of course, while I was outside, other images begged for my attention – walkers, runners, dogs, Canada geese, ice sculptures…after an hour and a half, I decided I was cold enough to come back inside. Still, it was a beautiful day, and I have these 5* selections to share with you. 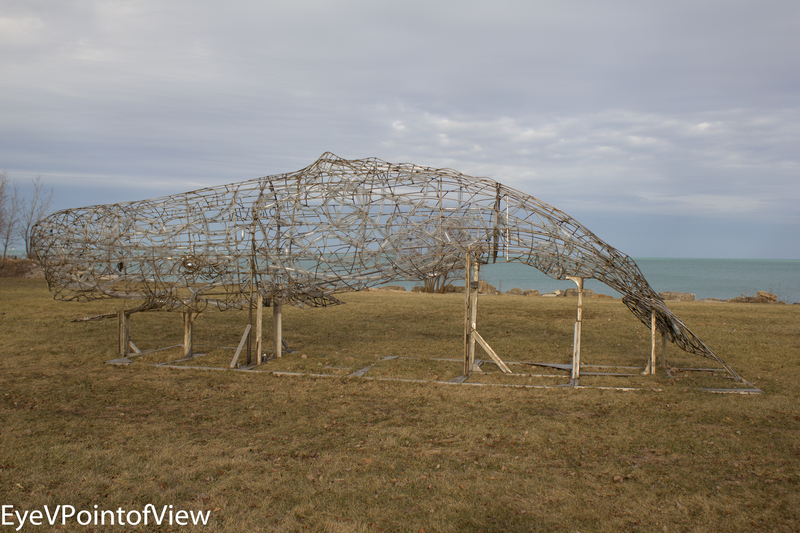 “The Whale” – This sculpture, by noted artist Preston Jackson, was created in 2012, and first installed near Monroe Harbor, but moved to the south lakefront this past fall. The sculpture, with its beads of plastic bottles lining its insides, is a statement about how plastics are destroying our environment. I wanted to showcase this art with the lake visible in the background. The Shadow (2) – the sculpture is striking, and shows up nicely as a shadow on the ground, as well as in its contemporary welded structure. Iced Over – It was windy and very cold on New Year’s Eve (14 below zero with the wind chill factor), so it is no surprise that the rocks and metal beams rising from the lake are iced over. 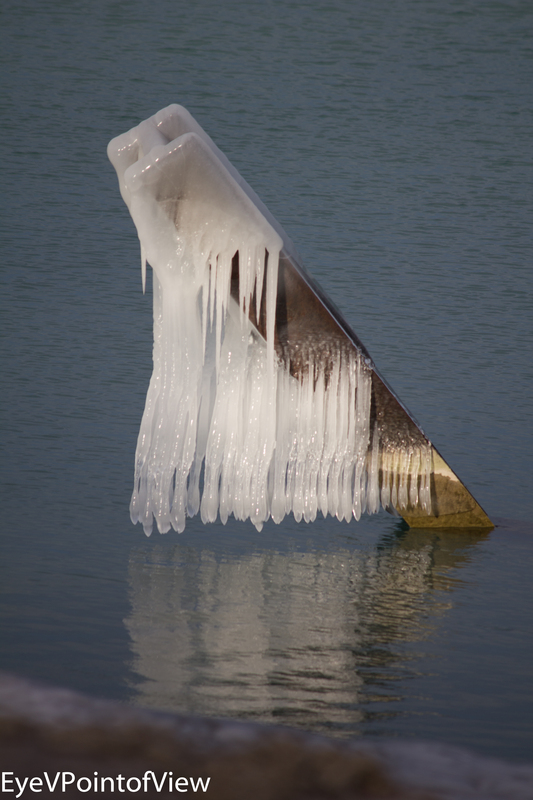 This beam, with individual threads of ice cascading over the sides is reflecting in Lake Michigan. 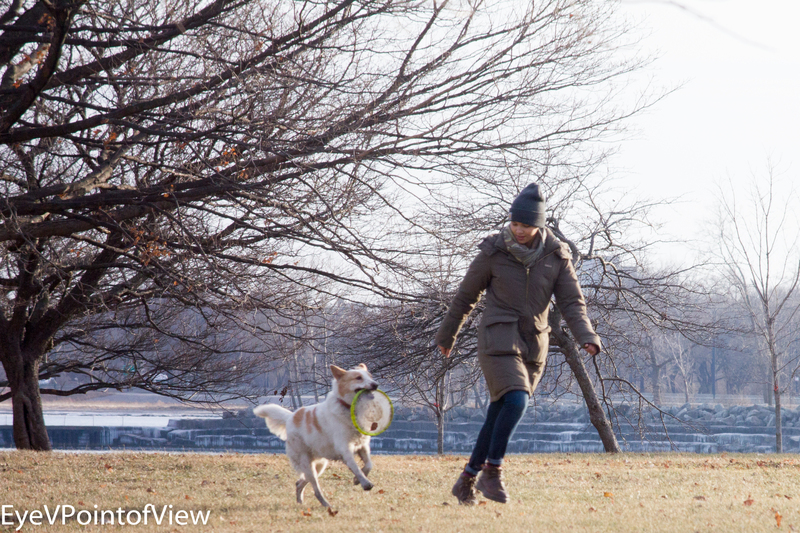 Play Time – As I walked around The Point (as it is affectionately called), I heard the dog, saw the Frisbee, then saw the dog frolicking with its owner. They made such a captivating team here, both running, their feet not even touching the ground. 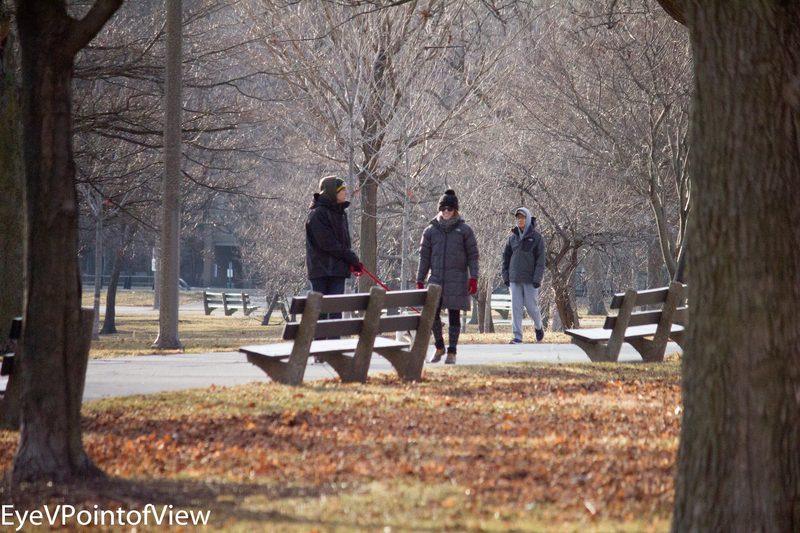 Holiday Stroll – These walkers, heavily wrapped to ward off the cold, are wonderfully framed by the grove bare trees lining the walkway on the Point. I loved the sunshine coming thru the trees and the still colorful leaves on the ground. Yes, it’s New Year’s Day, and we have no snow. I’m just sayin’…. I was not alone in taking this photo opportunity. I saw several other photographers taking advantage of the combination of time off and the day’s bright sunshine. I hope you enjoy my 5* selections from the day! 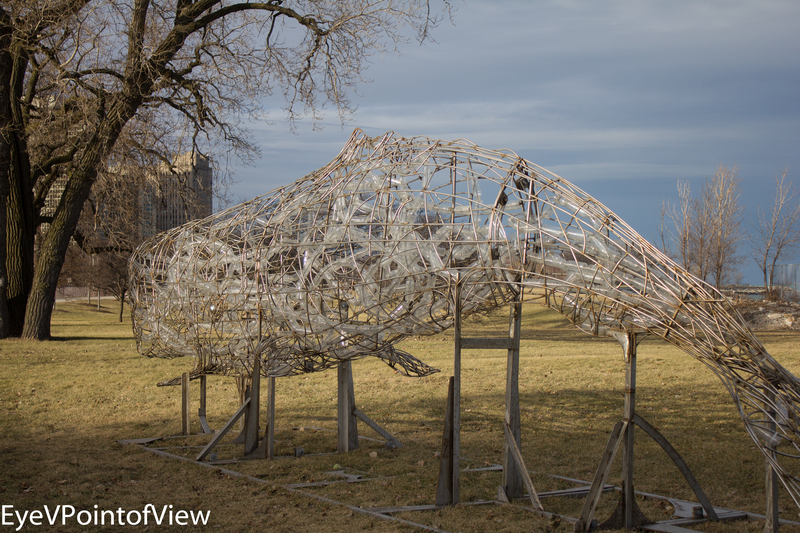 That whale thing is pretty cool! Yes, I always thought so, and was very excited when it moved to a location near me. Was happy to explore it up close and showcase it here.